One of the distinct perks of working in the Venture Capital and Private Equity world is being able to attend some great conferences (ok, ok, not all of them are amazing). During my 13 year career, I’ve attending conferences spanning from Las Vegas to Utah to beautiful Napa Valley. Along with ~150 finance professionals and service providers, I attended First Republic Bank’s 3rd annual Private Equity and Venture Capital CFO conference at the Silverado Resort in beautiful Napa Valley last week. Side note: If you haven’t been there, but are of those strange individuals that are interested into great food and wine, golfing, biking, and incredible sight-seeing, it’s time to get out there..like, NOW. I’ll get to the key takeaways of our conference in a minute, but first feel compelled to paint a picture of the amazing experience we had (keep in mind that I attended the conference on my 3rd day of employment at FRB). On Wednesday night, we started with a Country Fair/Carnival experience, complete with great food, carnival games, and of course, incredible wine (it is Napa, after all!). Side note – My blazing 62 MPH fastballs at the baseball pitching booth were a sight to behold. On Thursday, after a full day of content followed by a 15 mile bike ride (and winery tour), we enjoyed a 6 course French Laundry dinner at the famous Yountville culinary garden opposite the French Laundry. If that wasn’t enough, dinner was preceded by a strolling/tasting tour of all of chef Thomas Keller’s Yountville restaurants – Bouchon, Bouchon Baker, Ad Hoc, and Addendum. Absolutely amazing – it’s seriously one of those culinary experiences that forces you to eat about 43 times more than you planned to. 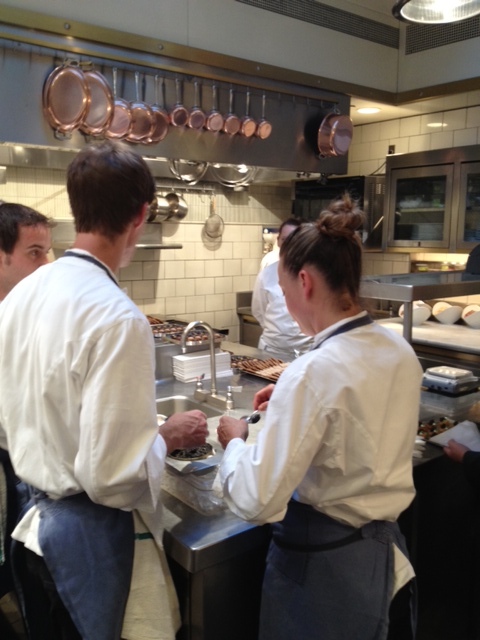 Check out the picture below from one of chef Keller’s kitchens. While the fundraising market remains extremely difficult for the vast majority of VC’s, there continues to be plenty of new fundraising activity. Cooley Godward expects to form about 60 funds in 2012, which is in line with the past few years. “ABF” – Always be fundraising (cue Glengarry Glen Ross). Regardless of whether you just raised a fund or not, you’re always fundraising through continued dialogue with Limited Partners and others in your network. Everyone in the firm is part of the fundraising effort, from the founding partners, to the finance staff, to the administrative support. Extensive fundraising cycles are not (obviously) viewed favorably by LP’s – it’s simply a distraction from the primary focus; investing. Placement agents – the top 5 Placement agents in the market are fairly successful in assisting funds with fundraising. They can be very expensive, even if the fees are paid in term. Out of a sample size of 30 fund raised over the past couple of years (3 <$100MM, 8 $100MM-$300MM, 19 $300MM+), 47% had premium Carry economics, with no funds under 20%. Many of these funds commanded 2.5%+ management fee structures. Many LP’s have a big problem with cashless contributions as it relates to GP allocations. LP’s are turning up diligence including: In office visits, Executive admin interviews, desire for detailed individual GP track records (What have you done for me lately is the prevailing attitude). A certain (unnamed) LP asked a fund manager to modify their cap call notice because it wasn’t 100% ILPA compliant. Sounds like they refused to make the call until they received the updated notice! LP’s are asking managers to provide management company operating budgets. Big area of emergence over the past several years. Most Micro-VC firms are founded by former Angels or entrepreneurs (several ex-Google/Paypal/Yahoo/Facebook). Cooley will form <10 this year, but characteristics they see from a Micro-VC are $35mm-$75MM in fund size, 1-2 General Partners. Premium terms are ubiquitous, 25% Carry standard in this segment. Fund sizes aren’t friendly for large pensions, foundations, and FoF, who desire larger allocation amounts. Most economists think there will only be moderate recovery. Very few foresee a strong economic recovery. 30% believe a double dip will occur. Side note #2: Economists depress me :). The US lost 8MM jobs in 08-09. Since February 2010, 4.2MM jobs have been replaced or created. North Dakota (yes, you read that right) has enjoyed the best job growth and real estate value growth over the last year. For those in Palo Alto, housing prices have increased 20% YoY (I feel your pain). The JOBS act will help smaller IPO candidates as confidential SEC dialogue and filings will be allowed up to 3-4 weeks before IPO date. For funds that are at the end of their life, it’s very rare for the fund manager to mail private stock certificates to LP’s. As such, fund extensions are essentially a given. Many funds do not charge additional management fees for funds that have been extended, however some will charge just enough to cover firm expenses. Some still charge standard end of fund life fees. Outsourcing actually makes the CFO and Full time finance MORE valuable, not less.